Fiji’s former President, Ratu Epeli Nailatikau has been appointed the Speaker of Parliament. 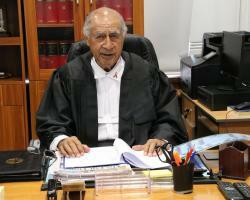 In a secret ballot today Ratu Epeli’s appointment was confirmed with 30 votes in his favor. Opposition Nominee Tayna Waqanika was defeated with 21 votes. Assistant Minister for Women, Veena Bhatnagar maintains her role as the deputy speaker of Parliament. Meanwhile, Fiji's Prime Minister Voreqe Bainimarama says former President Ratu Epeli Nailatikau was a standout choice as Speaker of Parliament. “It’s good, its, we are very honoured to have him as a Speaker and we all know that he’s going to do a good job,” said Bainimarama. It was also somewhat a bipartisan choice with the National Federation Party throwing their votes behind Ratu Epeli’s nomination. National Federation Party (NFP) leader, Professor Biman Prasad says they were simply using their prerogative. Ratu Epeli has previously served in the Speaker role from 2001 to 2005, a spur of the moment appointment then, after accompanying his wife Adi Koila Mara to be sworn in as a senator. “So I want to emphasise that, that I am here as the servant of this house and I look forward to working with you all,” said Ratu Epeli.